This is a collection of pages on the internet with interesting information(and what-not) on sneezing and the common cold. If you've come accross any more, please send their URLS, a moi. Merci! 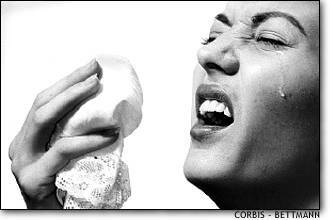 Sneeze Challenge- a University of Deleware class assignment, has links to sneezing fetish sites, pictures, sounds, etc. Ahh-Ahh-Ahh-Choo!- A small entry by a woman whose husband catches a cold twice... leading to the ineviatable. Also includes a few recipies. Nasal Nookie- Shanmonster discusses the sneeze fetish and her sudden fame within "the community"